kind and various candies are on display, each one looking a bit better than the last. My favorite is a big bag of warm peanuts in the shell. 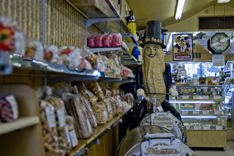 As an original Planters Roasting Facility long ago the Peanut Shop has a cool old look and is adorned with cool Mr. Peanut knick knacks as well. I&apos;m not even a huge candy person, yet I&apos;m tempted every time I go in there to buy a bag of cinnamon bears or swedish fish or something cool like that. This place has been downtown Lansing for a very long time, so many locals know it, love it and trust it. Visitors that find it are sure to have a new favorite unique spot in downtown Lansing. So yes, gotta love the old school and peanut shop is that. I guess I just find that things from back in the day had a lot more class and charm, call me nuts (ha ha) if you want to. Well that&apos;s my 2 cents, and maybe I&apos;ll see you down at the Peanut Shop (119 South Washington, downtown Lansing), I have to get in there soon and get some Cashews for my Dad for Christmas.